*SING* Is Ready To Skyrocket In A 50 Billion Dollar Mobile Payment Revolution! NEW ALERT: *SING*- SINGLEPOINT INC.
We are excited about tomorrow's alert, *SING*, because it is extremely undervalued at this current price. We expect to see a big correction take place in the near future with big things happening. The auditors are finished with the financials and they are ready to uplist. CEO Greg Lambrecht has stated that the company is excited about news this week about possible acquisitions the company is going to make. *SING* is way undervalued at this price given the market they are in and where they are headed. 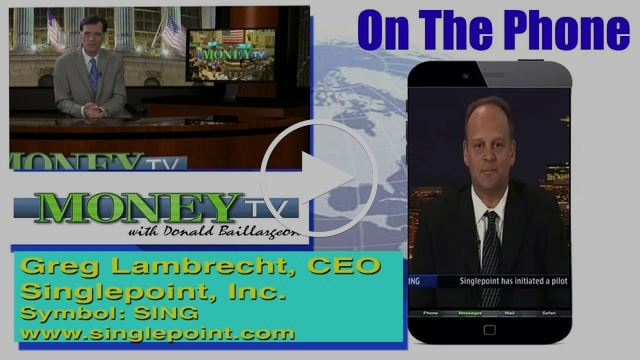 Check Out the MoneyTv interview below at with the CEO. SinglePoint Inc. (OTC:SING), is a full-service mobile technology and marketing provider. They provide solutions that allow their clients to conduct business transactions, accept donations, and engage in targeted communication through mobile devices. Their products connect small to mid-size companies, nonprofits, and religious organizations to their target markets by providing innovative mobile technology at reasonable rates. SinglePoint Inc. - Stock Symbol- (SING) The auditors are finished with the financials and they are ready to uplist. If you're looking for stocks to buy, the mobile payment space isn't a bad place to start. In fact, it's sort of hard to ignore. Mobile commerce is one of the fastest-growing and most visible ways consumers are changing the way they interact with technology, and everyone who's anyone wants to get in on the action. One highly respected market research outfit, Forrester Research, expects the U.S. mobile payments market to nearly triple by 2019, ballooning from $50 billion to $142 billion. It's tough to find a more attractive combination of growth and girth in any other industry. The opportunity is huge, and SinglePoint Inc. (OTC:SING) is seizing it. SinglePoint Inc (OTC:SING) is continually molding the mobile industry by designing new technologies such as Pay by Text™, Connect by Text, Text2Bid™, and TextaDay™ as well as supplying proven traditional payment products including cashless ATM's and credit card terminals. SinglePoint's brand SingleSeed Payments, is the leading payment solution provider to the cannabis industry. SingleSeed has brought the first all in one mobile vendor solution to the cannabis industry. Formerly all-cash businesses, merchants are now able to interact with their customers from initial contact through sale completion via the simplicity of the customer's mobile device. Providing mobile marketing gives our merchants a unique way to first engage with customers, make the sale, gather market data, and connect again post-sale to create a recurring relationship with their customer. Greg Lambrecht, Ceo and founder of SinglePoint Inc., Greg leads the company in its mission. He oversees all company operations including investor relations, leadership of the Board of Directors, and daily business activities. Greg has a successful track record of founding and leading start-up companies. As the founder of PCI, a leading consumer product distribution company, Greg negotiated agreements with the nation's largest retail outlets such as 7-11 (Southland Corp), Albertson's, and Costco representing 25,000 retail accounts. Greg lead PCI through a NASDAQ listed IPO, raising $10,000,000. In 2006 Greg started LifeStyle Wireless which he lead to the OTC Pink Stock Market changing the name to SinglePoint: ticker symbol SING. This Disclosure/Disclaimer must be read and fully understood before using this website or any affiliated or related websites, Facebook pages, twitter page, message boards or joining our e-mail list. Release of Liability: Through use of this website viewing or using you agree to hold www.topstocktips.com, its operators, owners TopStockTips Inc., and any affiliates, officers, directors, employees or related person(s) harmless and to completely release them from any and all liability due to any and all loss (monetary or otherwise), damage (monetary or otherwise), or injury (monetary or otherwise) that you may incur. TopStockTips, TopStockTips.com, their Members, officers, directors, employees, affiliates, or any other related person(s) (collectively, “TopStockTips”) are not registered as a securities broker-dealer or an investment adviser either with the U.S. Securities and Exchange Commission (the “SEC”) or with any state securities regulatory authority. TopStockTips as defined are neither licensed nor qualified to provide investment advice and you are specifically and adamantly advised not to rely upon anything said/posted/communicated/implied or expressed by TopStockTips as defined. The information contained in our website, message board posts, video charts, charts, e-mails, social media, or in any other medium should be viewed as commercial advertisement and is not intended to be investment advice or to be relied upon in any manner whatsoever . Any information contained in the TopStockTips as defined website, message board posts, video charts, charts, e-mails, social media and/or any other medium is(are) not provided to any particular individual with a view toward their individual circumstances and no relationship of trust or fiduciary or any other “duty” between TopStockTips as defined and any individual(s) is intended or created. The information contained in our website, message board posts, video charts, charts, e-mails, social medial, and/or any other medium are not an offer to buy or sell securities. TopStockTips as defined merely distribute opinions, comments and information free of charge exclusively to the individuals who wish to receive them and any such individual(s) are free to completely disregard receipt thereof and to remove themselves from the e-mail list and other medium at any time. Any such individual(s) should make their own investment or trading decisions completely based upon their own particular interests and circumstances, based solely upon their own due diligence and decision making, without regard to anything said/posted/communicated/implied or expressed by TopStockTips as defined. TopStockTips as defined website, message board posts, video charts, charts, e-mails, social media, and/or any other medium have been prepared for informational purposes only and are not intended to be used as a complete source of information on any particular company. The information contained herein is based on sources which we believe to be reliable but is not guaranteed by us as being accurate and does not purport to be a complete statement or summary of the available data. An individual should never invest in the securities of any of the companies profiled or posted/blogged about based solely on information contained in our website, message board posts, e-mails, blogs, charts, video charts, social media or in any other medium. Individual(s) should assume that all information contained in the website, message board posts, e-mails, charts, video charts, blogs, social media, and/or in any other medium mentioned or profiled companies is not trustworthy unless verified by their own independent research. Any individual who chooses to invest in any securities should do so with caution. Investing in securities is speculative and carries a high degree of risk; you may lose some or all of the money that is invested. Always research your own investments and consult with a registered investment advisor or licensed stock broker before investing. This is particularly true concerning “penny stocks” which are EXTREMELY speculative and risky. You should not invest or trade in any penny stock unless are you are fully prepared, willing, able and expect to lose 100% of your funds, including any profiled company or other company in any other manner mentioned or alluded to by TopStockTips as defined in any medium whatsoever. THERE are many warnings about “investing” in pink-sheet companies or even OTC (over the counter) stocks. TopStockTips as defined website, blogs, e-mails, message board posts, charts, video charts, social media and/or any other communications includes forward-looking statements pertaining to future anticipated projected plans, performance and developments, intended to qualify for the safe harbor from liability established by the Private Securities Litigation Reform Act of 1995. Any statements on this website that are not statements of historical fact should be considered forward-looking statements. These forward-looking statements generally can be identified by phrases such as “believes,” “expects,” “anticipates,” “foresees,” “forecasts,” “estimates,” “intends,” or other words or phrases of similar import. Similarly, statements in this website that describe a company’s business strategy, outlook, objectives, plans, intentions or goals, trading projections, also are forward-looking statements. All such forward-looking statements are subject to certain risks and uncertainties that could cause actual results to differ materially from those in forward-looking statements. STOCK TRADING INVOLVES HIGH DEGREES OF RISK AND YOU CAN LOSE ALL OF YOUR MONEY. Being a successful paper trader during one time period does not mean that you will make money when you actually invest during a later time period. Market conditions constantly change. When investing in securities or options you may lose all of the money you invested. Stock trading and investing involves risk of loss to investment capital and past performance is not a guarantee of future results. All material posted by TopStockTips is for informational purposes only and should not be construed as an offer or solicitation of an offer to buy or sell securities. By reading this or any post by this poster, you are accepting the sole responsibility for your own investment decisions. By reading messages on the internet by and , you acknowledge that the information here unto contained within the message is provided solely for general opinionated discussion and informational purposes only and therefore should not be considered to be complete, precise, accurate, or current investment advice. Beware that Internet posters, not only on the original message board where this disclaimer was discovered, but other message boards not limited to the originating website may be increasing or decreasing their share positions in a security regardless of what they are posting and/or may be compensated in some way from a company or 3rd party investor in the company mentioned in the post. The nonaffiliated third parties who compensate may or may not have have shares and may liquidate which could affect the stock price. Assume that any security mentioned is owned by and and that and may be buying or selling or adding or subtracting from a position they may have regardless of anything said, inferred, construed, or believed before or after starting a company profile. Always do your own due diligence prior to making an investment decision. Never borrow money to buy penny stocks, and always remember that all penny stocks are highly risky. Also be aware that information provided concerning certain securities contains forward looking statements that involve risks and uncertainties. AS IN ANY INVESTMENT, NEVER INVEST IN A PENNY STOCK UNLESS YOU CAN AFFORD TO LOSE YOUR ENTIRE INVESTMENT. No statement within Internet messages or made by this poster and past, present, or future should be construed as a recommendation to buy or sell a security or to provide investment advice. Past performance is not indicative of future results. Trading securities and options involves extreme risk and professional guidance And does not give specific trading advice nor claim that a thorough analysis of each security mentioned has been conducted. and and all affiliated members are not Financial Analysts, Investment Brokers, Financial Advisers, or any sort of professional that would be deemed as an individual someone would rely upon for investment advice. You should discuss the asset allocation and risk tolerance level which is appropriate for your personal financial situation with a professional financial planner/adviser. and and all affiliated members encourages viewers of messages to invest carefully and read the investor information available at the web site of the SEC at: http://www.sec.gov prior to investing in anything. You should also not make any trades or decisions based upon anything said or written with regard to investments without consulting a professional financial planner/adviser. Always assume at all times that internet message board posters may have a position in any of the securities they mention and could be buying or selling at any time. Any opinions expressed are subject to change without notice. Absolutely anything and everything said/posted by TopStockTips Inc., TopStockTips and any individuals, members, affiliates or related persons thereof, however expressed, is solely for the purpose of raising awareness or for entertainment purposes only and ABSOLUTELY UNDER ANY and ALL CIRCUMSTANCES SHOULD NOT – REPEAT NOT – BE RELIED UPON IN ANY MANNER WHATSOEVER TO BASE INVESTMENT/TRADING DECISIONS. The sole purpose of anything and everything said/posted by TopStockTips Inc., TopStockTips and any individuals, members, affiliates or related persons, however expressed, concerning any publicly traded stock(s) and/or any facet of any publicly traded stock(s) is to bring the subject stock(s) to the awareness of the general public, i.e., awareness of the existence of the subject stock(s) from which individuals of the general public may conduct their own due diligence and investigation upon becoming so aware. Said general public should conduct their own due diligence and base any and all investment/trading decisions whether to take action or not to take any action based upon facts, knowledge and information gleaned from first-hand investigation and not in reliance from anything said/posted by TopStockTips Inc., TopStockTips and any individuals, members, affiliates or related persons thereof. Any investment/trading decisions, including but not limited to, whether to buy/sell or not to buy/sell, or the timing and price points associated therewith, should SOLELY be based upon the facts, opinions, interests, knowledge and circumstances of each individual of the general public as they relate to him/her individually WITHOUT RELIANCE AT ALL on any posted/said by TopStockTips Inc., TopStockTips and any individuals, members, affiliates or related persons thereof. Absolutely anything and everything said/posted by , , TopStockTips Inc., TopStockTips and any individuals, members, affiliates or related persons thereof, however expressed, is meant for awareness only and otherwise is intended and should be received with a “grain of salt” and NOT for any educational or reliable information purposes or any purpose whatsoever upon which to base investment/trading decisions Make your own investment/trading decisions based 100% upon your own best interests and circumstances completely irrespective of what ANYONE, including but not limited to or TopStockTips may say/post on any Internet message board, website or social media. We are primarily, but not exclusively, momentum “momo” traders and technical analysis “t/a/” traders. This type of trading is highly speculative and short-term, usually holding any security for a few minutes to a few weeks, at most. The risk of loss is substantial and reliance of anything said/posted by TopStockTips Inc., TopStockTips and any individuals, members, affiliates or related persons thereof, however expressed, particularly unworthy of reliance to make investment or trading decisions. This site (the “Site”) , its affiliated members and its management”) is subject to the terms and conditions of this agreement (the “Agreement”). The information provided on this Site is provided by and, its affiliated members and its management and its third party suppliers (“Information Providers”). The stock content and newsletter is not an offer to sell any securities and it is not soliciting an offer to buy any securities or conduct investment business. Information provided in the Service is for reference purposes only and does not represent itself to be offering or recommending any securities to be bought or sold. It should not be regarded as a recommendation that any investment is suitable for a particular investor. We are neither brokers nor stock advisors. The service is provided as a guide to some available investments only, which must be tempered by the investment experience and independent decision making process of the subscriber. The accuracy of issuer documents and information that is submitted to and, its affiliated members and its management for inclusion on this site is principally the responsibility of the particular issuer and its management. , its affiliated members and its management is neither responsible for, nor undertakes any steps to check, the accuracy of any information provided by featured companies to potential investors. You should confirm to your own satisfaction the veracity of any information prior to entering into any investment. The information on this site is not designed to be used as the basis for an investment decision. “Some companies pay the people who write online newsletters cash or securities to “tout” or recommend their stocks. While this isn’t illegal, the federal securities laws require the newsletters to disclose who paid them, the amount, and the type of payment. But many fraudsters fail to do so.” In order to be in full compliance with the Securities , Section 17(b), any consideration to TopStockTips Inc., TopStockTips, and, its affiliated Members and its management will be fully disclosed if applicable. and , and/or any of its affiliates, principles, employees, clients, partners, directors, agents, and the respective family members may from time to time buy or hold shares of any of our profiled companies prior to releasing it to the membership via email or website posting. We also may sell our shares in any profiled company at any time after the profile has been released to the membership which may allow us to profit from the sale. In order to be in full compliance with the Section 17(b), and , its affiliated members and its management fully disclose that they receive fees from profiled companies or agents representing the profiled companies. These fees may be paid in cash, securities of profiled companies, or both, and will be completely disclosed for each profile. You should be aware that the aforementioned have a present intent and may buy or sell before, during, and or after (or any other possible combination) any and all companies that are mentioned by and , its affiliated members and its management. On occasion and , its affiliated members and its management will receive compensation from a third party in relation to the companies being profiled &/or mentioned in internet posts. In such a case and its affiliated members and its management, directly mentions this in its disclaimer sent to our subscribers and accessible in any online post. and its affiliated members, management associates, relatives and anyone associated with and , its affiliated members and its management, in any manner reserves the right to either BUY or SELL shares in the profiled company’s stock, either BEFORE the date of the profile, DURING the date of the profile or at ANY time after the date of the profile. Do your own research and due diligence (DD) before investing in any company. Its affiliated members and its management, merely is providing information and is in no way nor manner suggesting an investment in any company or investment opportunity. You the investor are making decisions for yourself. We may have an inherent conflict of interest by sending the newsletter, sending e-mails, or posting any online messages at the same time we may own stock in the same company or even have been paid compensation at the time of the profile/promotion. We reserve the right to either BUY or SELL shares in the profiled company’s stock, either BEFORE the date of the profile, DURING the date of the profile or at ANY time after the date of the profile. Under no circumstances shall any member of and , its affiliated members and its management, be held liable for any loss incurred by any individual or individuals as a result of any individual or individuals decision to invest in any company profiled by and , its affiliated members and its management. Viewing this web site, newsletter, or any Internet post on various Internet sites and viewing picks on this web site newsletter or online post sent or read shall not create under any circumstances an offer to buy or sell stock in any company profiled. Nor shall it create any principal-agent relationship between viewer and , its affiliated members and its management. Short term investing involves significant risk, and you can lose some or all of your investing capital. Please contact a qualified financial planner before investing in any stocks, including those profiled or posted on the internet by and , its affiliated members and its management. Issuers or non-affiliated third party entities who compensate and , and its affiliated members, at times, may have shares and may liquidate them periodically which could affect the supply and demand of a particular security, ultimately causing volatility in price per share. The issuer or third party may have shares in the company profied and may liquidate their shares, which may negatively affect the stock price. This compensation constitutes a conflict of interest as to our ability to remain objective in our communication regarding the profiled company. and , its affiliated members and its management, may receive consulting compensation in the form of cash and or stock for strategic consultation and profile coverage through various websites, updates and or newsletters. TopStockTips was compensated one thousand dollars via wire for this alert of SING by the company. Strategic market consultation can include marketing investment ideas, website profiling, added traffic to company websites, stock research, short research, weekly/daily/monthly newsletters, handling investor related phone calls, writing/releasing corporate press releases, sharing investment ideas and company profiles with stockbrokers at various brokerage firms who may also trade penny stocks. Copyright © 2015 TopStockTips Inc., All rights reserved.